A wall with lots of signs at 821 Broadway, northwest corner of 12th St. 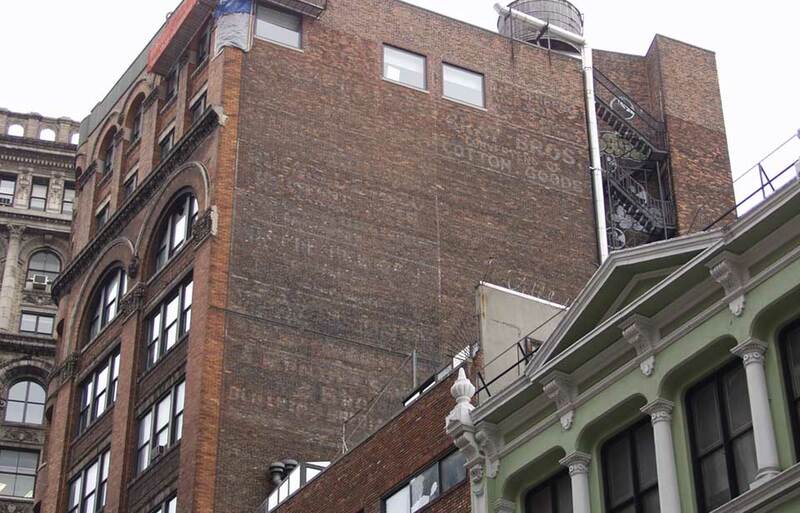 The most readable sign here is Gray Bros. / Converters of / Cotton Goods (click for closer view). The Gray brothers were Jacob, Henry and Isidor Gray, and they were located here from 1918 to 1930. The brothers were immigrants from Russia in the early 1890s. Gray Bros., cotton converters, were established around 1916 at 43 E. 8th St., then moved to 821 Broadway in 1918. From 1931 to 1947 they were located at 97 5th Ave., then later (1948 to 1952) at 1181 Broadway. In the textile industry a converter is defined as "A person or a company which buys grey goods and sells them as finished fabrics. A converter organizes and manages the process of finishing the fabric to a buyers' specifications, particularly the bleaching, dyeing, printing, etc." (www.fabriclink.com). Jacob Gray (1873?-1934) was the oldest brother. He appeared in the 1910 U. S. Census and the 1915 New York State Census living at 57 Manhattan Ave., Brooklyn. By this time he already had a sizable family (six children), including his son, Leon, age 11 in 1910. Jacob Gray's death notice New York Times, 4 July 1934, read, "Gray - Jacob on July 3, 1934, beloved husband of Yetta and devoted father of Leon, Moe, Seymour, Sylvia Leibler, James and Dorothy, and dear brother of Henry, Isidor, Israel and Hannah Greenblatt. Services Wednesday, 2 P. M., at Flatbush Memorial Chapel, 1,283 Coney Island Av., near Avenue J, Brooklyn." Henry Gray (1876-1948) received a sizable obituary in the New York Times, 11 May 1948, reading in part, "Henry Gray, a retired cotton merchant, associated with Gray Brothers, 97 Fifth Avenue for fifty years, who was interested in Jewish philanthropies in this city, died early yesterday at Mount Sinai Hospital after an illness of several weeks. He was 72 years old. His home was at 21 West Eighty-fourth Street." Henry Gray registered for the World War I draft in 1918, age 43, born 6 March 1876, and gave his occupation as "Cotton Goods, Self, 821 Broadway, NYC NY." In the 1940 U. S. Census he lived at 1155 E. 18th St., Brooklyn. Isidor Gray (1879-1972) registered for the World War I draft in 1918, age 39, born 15 April 1879, gave his occupation as "Cotton Goods Converter, Gray Bros. 821 Broadway." He also registered for the World War II draft in 1942 when he was 62 years old, born 7 March 1879, Russia, and employed "Self, 97 Fifth Ave., New York, NY." The Social Security Death Index for Isidor Gray gives 7 March 1879 as his birth date. A second generation member of Gray Bros. was Jacob Gray's son, Leon Alfred Gray (1898- 1971). Leon Gray registered for the World War I draft in 1918 when he was a student at New York University. His nearest relation was Jacob Gray (father) living at 695 Greene Ave., Brooklyn. By the time of the 1920 U. S. Census Leon Gray's occupation was "assistant manager, cotton goods." Somewhere between 2005 and 2007 new windows were punched in this wall. One of these destroyed part of the Gray Bros. sign. All of these seem either to have faded or to have been painted over by later signs. Of the signs that were readable in 2003, only Russell Emb. Co. was clear. Russell Embroidery was located at 821 Broadway from 1908 to 1912. The company, also known as Russell Embroideries, was in business in New York approximately 40 years from 1901 to 1940. In 1913 New York State's Register of Factories recorded Russell Embroidery Co., located at 116-120 W. 32nd St., employing a total of 40, consisting of 2 men, 31 women, 1 child and 6 office staff. In the early 1920s the name of the company changed to Russell Infants Wear, then around 1929 to Russell-Tumpson Corp.. In the 1930s Russell assumed a variety of names including the Minneapolis Knitting Works. The namesake and founder of Russell Embroidery was Alfred Russell Jr. (1877-1966), born 13 March 1877, died July 1966. Alfred Russell followed his father, Alfred Russell Sr., into the infants wear business. Alfred Jr. can be found in the 1900 U. S. Census living with his father, mother and other familiy members at 188 Edgecomb Ave., Manhattan. Alfred Sr., born 8 Aug. 1845, Albany, N. Y., was described as an manufacturer of infants wear, as was Alfred Jr.
An early associate of Alfred Russell at Russell Embroidery was Sidney Worms (1878-1949), born 27 July 1878, died October 1949. Worms seems to have been a partner in the business from its inception. The Trow Copartnership directories for 1906, 1908 and 1909 listed him as president of the corporation. In 1910, however, Worms appeared as president of Franklin Knitting Mills. In 1918 Sidney Worms registered for the World War I draft, age 40, manufactuer, knit goods, Franklin Knitting Mills, 511-519 East 72nd Street, New York City. Franklin Knitting Mills were listed at 511 E. 72nd St. from 1910 to 1934. This ad detailing patents secured by Franklin Knitting Mills appeared in Sweater News, Feb. 1920. When Sidney Worms registered for the World War II draft in 1942 he worked for David Ritter, Inc., 1329 Broadway. Another partner was Clarence H. Leyton (1870-1929). He was first listed with Russel Embroidery in 1907. The Trow Copartnership directories for 1908 and 1909 listed him as secretary, but in 1910 and 1915 he was president. Leyton's death notice in the New York Times, 29 Nov. 1929, read simply, "Leyton - Clarence H., on Nov. 28, suddenly. Funeral at conveniece of family." Beginning in the 1910s another officer at Russell Embroiderly was Louis Arthur Weisenberg (1885-? ), born 13 May 1885, Cleveland, Ohio. He registered for the World War I draft in 1918 when secretary and treasurer, Russell Embroidery Co., 7 W. 35th St. At the time of the 1942 World War II draft Weisenberg lived at 170 W. 73rd St., Manhattan, and was employed at Thomas Textile Co., 71 West 35th St., New York City.